The Salt Chuck property consists of 146 contiguous federal lode mining claims (BLM) (10.85 km2 ) with a combined area of 1,085 ha. Pure Nickel owns 100 % of the property. The property is located approximately 3 km southwest of Thorne Bay on Prince of Wales Island, southeast Alaska. The property claims cover the 429 million-year-old Salt Chuck igneous complex (pyroxenite-gabbro-diorite) and the adjacent volcaniclastic-sedimentary host rocks. The property includes a former Cu-Pd-Au-Ag producing mine. The Salt Chuck mine produced approximately 300,000 metric tonnes of ore, reported by US government summaries (1948) to be 0.95 % Cu, 1.96 g/t Pd, 1.12 g/t Au and 5.29 g/t Ag. No current mineral resources or mineral reserves have been determined for the mineralization that remains at the mine. The identification of drill targets, and the history of mineral production and geology of the area, supports a recommendation for aggressive exploration of the area for bulk-tonnage deposits amenable to open pit mining operations. 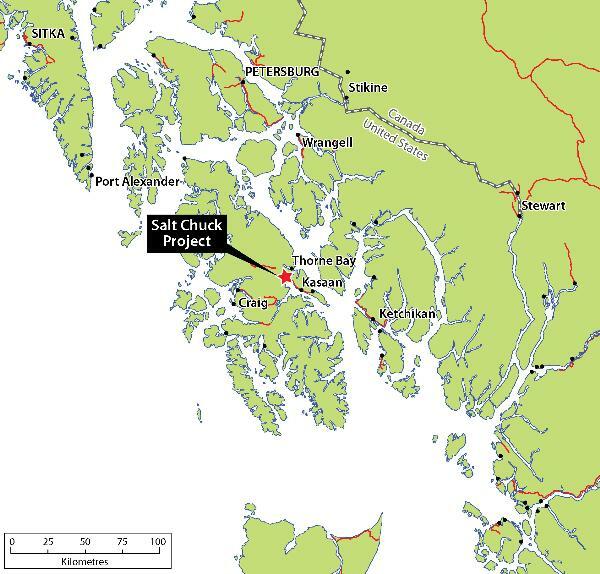 The Salt Chuck property is located in southeast Alaska on Prince of Wales Island, approximately 70 km northwest of Ketchikan, 3 km southwest of the coastal community of Thorne Bay and 12 km northwest along a secondary road from Kasaan. Access to the property is by ferry from Ketchikan to Hollis on the eastern part of Prince of Wales Island, then 80 km of paved road and 9.5 km of gravel road to the Salt Chuck property. Regular air service to Craig on the western side of Prince of Wales Island is available from Ketchikan, then 65 km of paved and gravel road leads to the property. The Salt Chuck mafic-ultramafic complex occurs in a northwest-trending folded succession of Paleozoic sedimentary and volcanic rocks and Paleozoic to Mesozoic intrusive rocks comprising the Alexander terrane of southeastern Alaska. Immediate host rocks to the early Silurian (429 Ma) Salt Chuck intrusions are weakly metamorphosed volcaniclastic and sedimentary rocks of the Lower Silurian to Lower Ordovician Descon Formation. 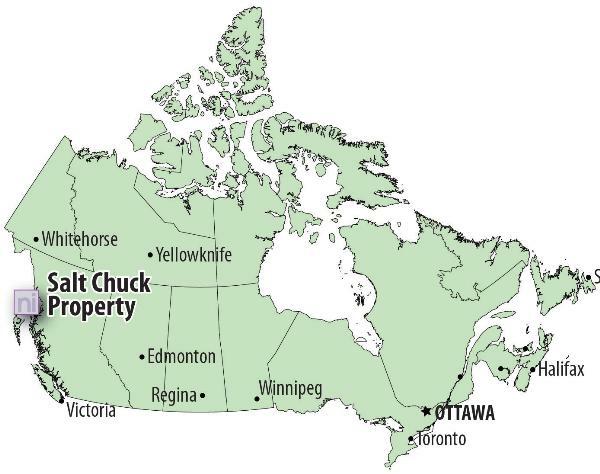 The northwest-trending Salt Chuck mafic-ultramafic igneous complex is approximately 7 km by 1.6 km in dimensions. The northwest portion of the complex is a massive to weakly foliated diorite and gabbro with discontinuous bodies of magnetite-clinopyroxenite cumulate and melagabbro. The southeastern portion of the intrusion complex hosts the Salt Chuck mine. The rocks there consist of a central core of coarse grained clinopyroxenite enveloped by medium-grained gabbros and diorite. The pyroxenite core unit plunges moderately-to-steeply southeast and generally grades into the surrounding layered gabbro. Coarse grained pegmatite, pegmatitic cumulate, and coarse polylithic to monolithic intrusive breccia forms irregular bodies within the pyroxenite and especially along the pyroxenite-gabbro transition. Magnetite is a common constituent of the intrusive rocks. In addition to the mafic-ultramafic suite of lithologies in the complex, there are areas of leucocratic diorite and quartz diorite. Younger intrusive rocks may be an important heat source for mobilization of copper and precious metals within and adjacent to the mafic rock complex. The Salt Chuck mine was initially known as the Goodro or Joker prospect. It was discovered in 1905 by Charles Goodro and operated as an intermittent underground mine until 1915. At that time, the ore was hand sorted and shipped with grades reported to be 4 % Cu, 4.25 g/t Au and 4.25 g/t Ag. Platinum was identified in the ore in 1915, but it was not until 1917 that palladium was identified. The Salt Chuck Mining Co. took over mining operations from 1916 to 1923 with a milling capacity of 27 tons/day. The company was reorganized in 1923 under the name Alaska Palladium Mining Co., and mill capacity was increased to 272 tons/day until it closed in 1926. Alaska Gold & Metals Co. operated the property from 1934 through early 1941. Reported production from 1916 through 1941 was 296,000 tons of ore grading 0.95 % Cu, 2.0 g/t Pd, 1.1 g/t Au and 5.7 g/t Ag. No production has taken place since then. 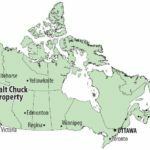 There is no history of NI 43-101 compliant mineral resource on the Salt Chuck property. During WW-II, the United States Bureau of Mines (USBM) conducted surface exploration and underground investigations including limited drilling. Results of that work indicated 133,356 metric tonnes of ore grading 0.69 % Cu, 0.25 g/t Au and 3.0 g/t Ag. The cut off grade was 0.2 % Cu and palladium was not determined with accuracy due to lack of assays. USBM also conducted beneficiation tests and determined that the ore is amenable to flotation concentration. Orbex Resources Inc. conducted exploration at Salt Chuck in 1980-89, Stealth Ventures in 1997-98 and Santoy Resources from 1999-2005. The State of Alaska contracted airborne geophysical magnetic and electromagnetic surveys over the intrusive complex and the surrounding region with Geoterrex-Dighem during 1999. 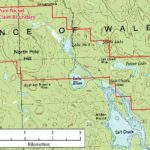 Nevada Star Resource Corp. staked 31 federal mining claims in the vicinity of Power Lake (the southeastern projection of the main portion of the mafic-ultramafic intrusive complex) in 2000. Pure Nickel staked 115 contiguous federal claims northwest of the Nevada Resource Corp. claim block to cover the area formerly held by Santoy. The merger of Pure Nickel with Nevada Star has resulted in a single claim group comprising approximately 2,681 acres covering the exposed portions of the Salt Chuck intrusive complex. The Salt Chuck mine was the largest producer of palladium in the USA during its era of production. It was also a producer of relatively high grade copper ores with credits in gold and silver. The nature of the copper-precious metals mineralization at Salt Chuck is amenable to exploration for bulk-tonnage ore deposits (rather than to explore solely for pods and shoots of high grade mineralization). 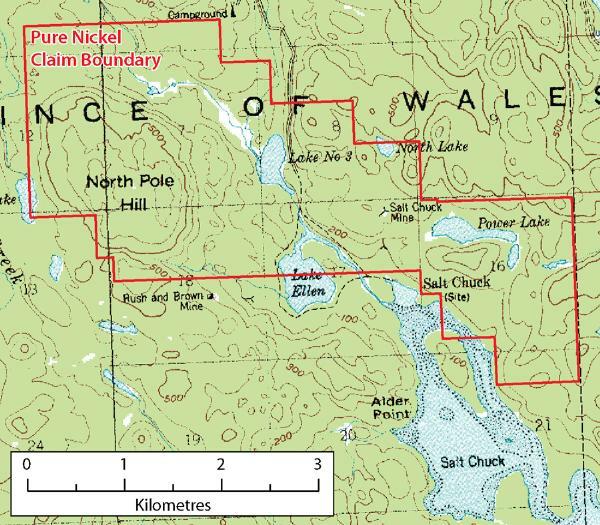 A 14-hole, approximately 5,000m diamond drilling program is proposed, which targets geophysical anomalies and checks on historical drill results in the North Pole Hill and Salt Chuck mine areas. As well, a reinterpretation of the 1999 airborne mag-EM survey is expected to identify additional magnetic and conductivity targets that can be initially investigated through a soil geochemical sampling program. 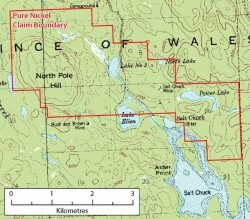 Because rare earth elements and uranium in potentially economic concentrations have been discovered in pegmatitic rocks associated with younger intrusives on Prince of Wales Island, it is proposed that pegmatites associated with both the Salt Chuck Complex and the younger intrusive to the north be investigated by multi-element analyses of specimens from known pegmatitic outcrops as well as stream sediments collected downstream from contacts of intrusives.